Leif Svalgaard suggests solar cycle 24 could be similar to solar cycle 14, which had a long flat top, which is in line with Jan’s comment. 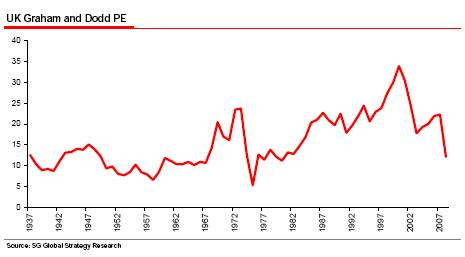 So how did that affect the secular asset cycle back in the early 1900s? As you can see from my notation, the secular peak (which was in stocks) occurred on the nose of the official solar peak, which was near the front end of the flat top. 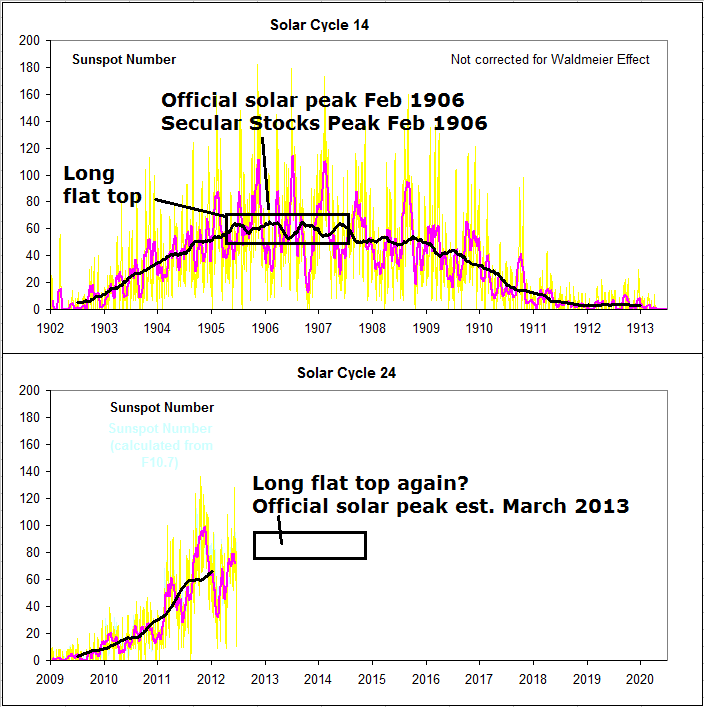 So, if SIDC and NASA are correct in their predictions for a Feb/Mar 2013 official solar peak, then we might expect the secular peak (in commodities) to occur close to that, rather than towards the end of the flat top, if such a top extends out into 2014. I have updated all the models, on their respective pages. Geomagnetism continues to be a good guide. Here I have highlighted the periods of higher geomagnetic disturbances corresponding to periods of correction for the stock market. The question is whether the most recent period if now over, or continues. Seasonality suggests we should experience fewer disturbances through to August, which if so, would be supportive of upside for pro-risk. That would fit with a period of mean reversion coming to pass away from recent extremes of oversold and overbearish in pro-risk. The shorter term geomagnetic lunar models continue to perform. The last two lunar turns were on the nose and the cumulative geomagnetism trend has provided an overall route map for the markets. Here are the Dax and the CRB commodities index, with the tails showing the forecast for the next 3 weeks. As yet the model does not show a renewed upturn, but commodities, being below model, have room to pull up. Which brings me to the title, as in the last week we’ve seen soft commodities wake up and put in daily gains of up to 7% in some foodstuffs, as the hot dry weather in key producer parts of the world comes into focus. Agri gains have been made despite other pro-risk assets pulling back. As I previously stated, whether the extreme weather continues into the end of July is likely to determine whether or not we see a run away rally in soft commodities to new highs in H2 2012. I have previously shown charts displaying close relationships between the different commodity classes, so if softs do take off in a meaningful way, that should provide the impetus for precious metals to break out. As you know, I believe the secular commodities conclusion is ahead, following next year’s Spring solar maximum. Increasing sunspots inspire speculation and growthflation. The current window of economic weakness is providing the opportunity for another round of global central bank supportive and stimulative interventions. 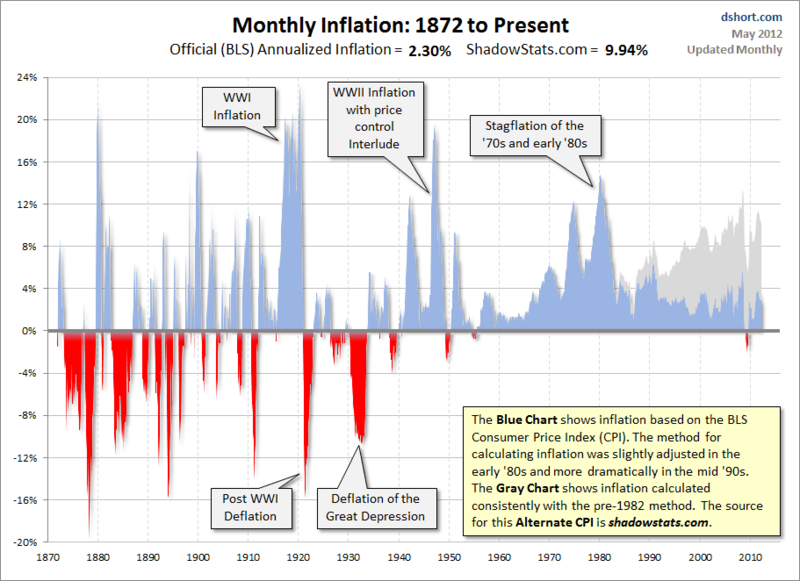 More needs to be done in this regard, but I expect the natural pick up in growth, speculation and inflation combined with the aid of the central banks to come to fruition. Currently, we continue to see problematic levels for Spanish and Italian CDSs. 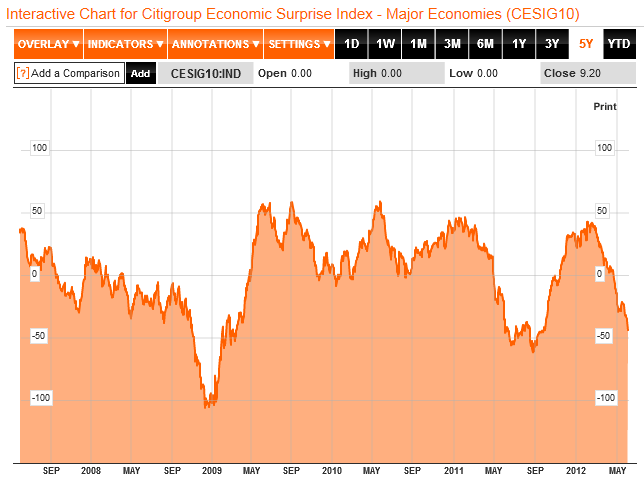 Economic Surprises continue to languish. Chinese leading indicators came in better yesterday at +1.1% (Conference Board), but other leading indicators have been largely negative. I am not belittling these issues, but refer you again to the secular position and recent extremes in indicators, whereby we are more likely to see pro-risk rise on slight improvement in these areas, rather than fall again. Here is someone else who shares my view that secular stocks bulls need redefining from the nominal lows, and concurs that the new secular stocks bull began in 2009, noting the similarities to the last two secular nominal lows. 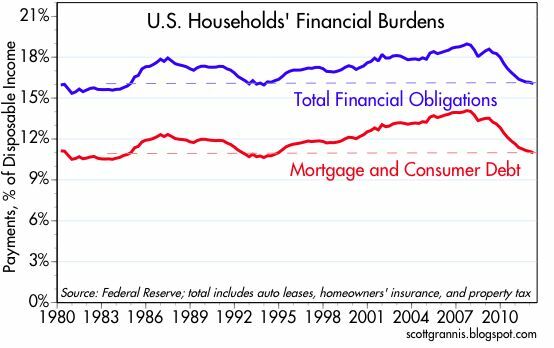 And here is a chart from Scott Grannis showing how US housholds have largely completed their secular deleveraging, allowing the private sector to releverage from here (despite the increase in public debt). This also fits with US housing increasingly showing it bottomed already. Evidence increases that we are into a secular inversion period. The timing is however critical – when to switch out of commodities and bonds and into stocks and real estate, in terms of longer term buy-and-hold. I maintain the blow-off top should still be ahead for commodities, which provides the best opportunity out of the 4 classes into 2013 – I believe. 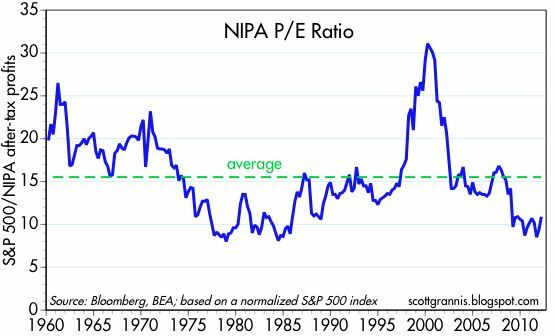 But that will be the final pop, as relative cheapness of stocks and real estate to bonds and commodities reach historic extremes. Yesterday was the new moon, and downward pressure now emerges on my lunar geomagnetic models as of tomorrow. It gives us a set up whereby today’s FOMC could disappoint the markets, because of the trio of short term overbought, technical resistance, and lunar/geomagnetic down pressure as of tomorrow. Now let’s just step back a moment and see the bigger technical picture. 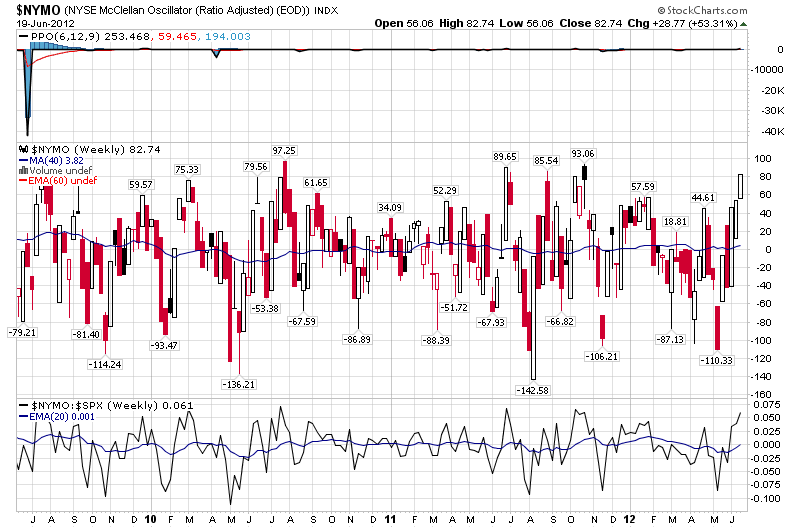 Bullish percent and put/call ratio are down at the low extreme still, suggestive of a more enduring rally. 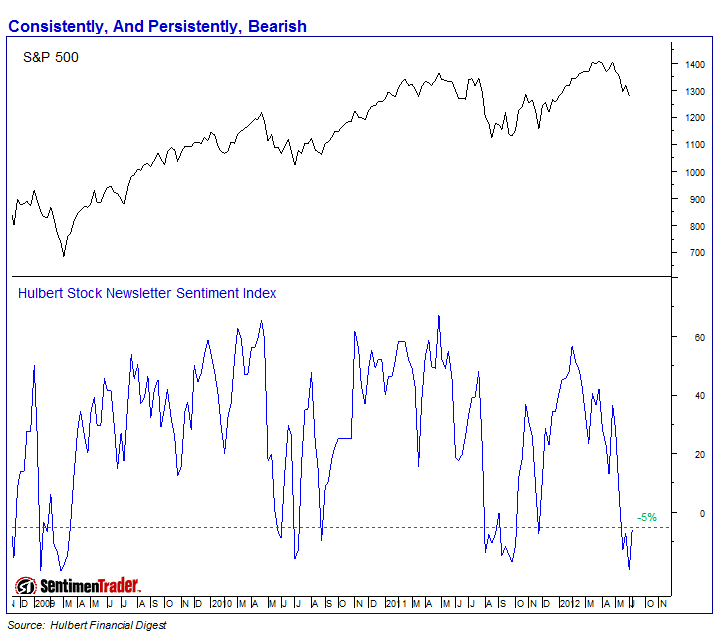 Hulbert Stock Newsletter sentiment is at the low extreme level that suggests a more enduring rally also. A spike in bearish ETF volume is synoymous with previous important lows and significant upside ahead. 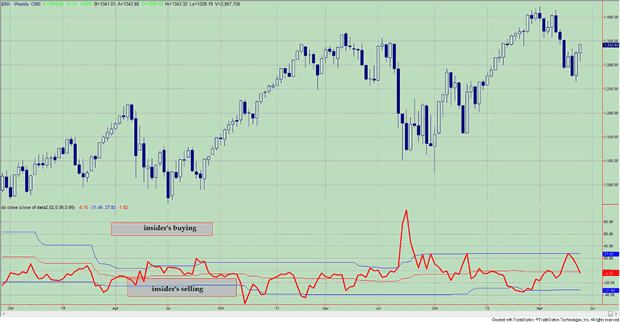 The recent pop in insider buying is suggestive of the market rallying ahead, as this smart money historically calls it correctly. And a low extreme followed by a new upturn in breadth also reflects important previous bottoms. In short, the technical picture for US stocks is bullish in a multi-week/month timeframe. So, if a short term pullback comes to pass, it is likely to be followed by further upside. 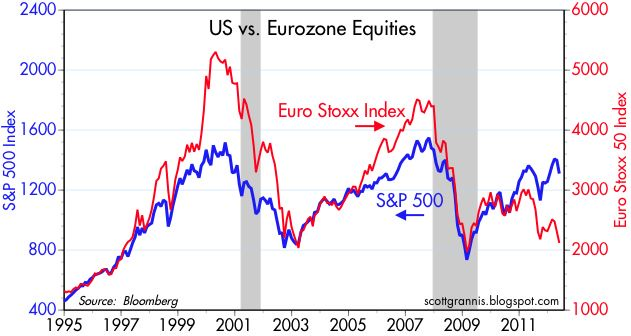 If we draw in recent oversold/overbearish extremes in global stocks, commodities and the Euro, and the recent parabolic rise in treasury bonds, we have further support for an enduring move out of safe havens and into pro-risk. 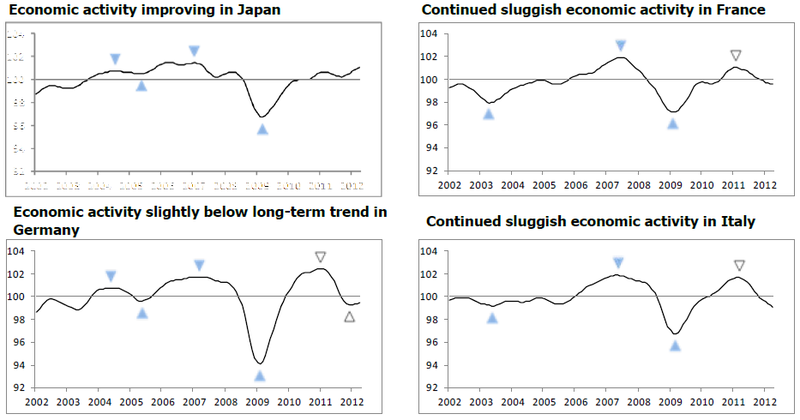 Yet, the global macro picture continues to deteriorate. Economic surprises continue their downtrend and don’t display a pull-up ahead of a stocks rally, as we have seen the last couple of years. Leading indicators continue to decline – yesterday Australia came in at -1.4% (Conference Board). Euro CDSs continue to flirt with records. As I previously stated, a mean reversion rally away from the oversold/overbearish extremes in pro-risk was likely to occur, regardless of the outlook, and we are seeing that currently. Either leading indicators and economic data start to improve and pro-risk does more than just mean-revert, or mean reversion then gives way to further declines. US earnings begin again with Alcoa 9th July. The recent off-season beat rate has been almost 80% which suggests we may see a bullish earnings season. Presidential cycles are supportive of upside into the US November elections, but that is largely because the President creates a positive backdrop into the elections, with concrete actions and also data spin. We start today with the FOMC and see how supportive the outputs are. 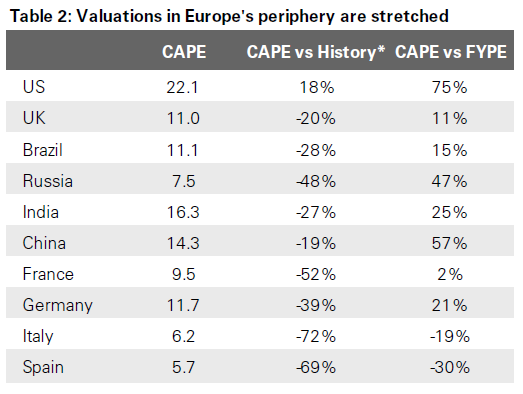 Meanwhile, European leaders still need to do significantly more if they are to diffuse Euro CDSs. China also appears to need to do more to stimulate and other countries also. Agricultural commodities had a bumper day yesterday, as concerns over the hot dry weather came to the fore. One day doesn’t make a trend but data shows that commercials were taking positions, not just speculators. I believe June and July’s climate data will really determine whether or not we see a major H2 rally in soft commodities this year. I am going to take a couple more pro-risk profits today, selling into the strength before the unknown of the FOMC, but still retaining the vast bulk of my pro-risk positions. As I stated above, there are reasons for a short term pullback (unless the Fed really goes full-stimulus, which I don’t believe they will). Thereafter I remain of the view that the speculative push into the solar peak of 2013 will occur. As noted above the technical picture for Euro, dollar, bonds, stocks and commodities very much suggests an enduring rally should emerge here. I therefore believe slightly less bad news in terms of leading and current data and developments is likely to spur pro-risk higher, i.e. it doesn’t have to be great, just better. I also believe we are in the midst of another period of global central bank easing and stimulating action and that we will see further rate cuts and credit easing actions and the like. 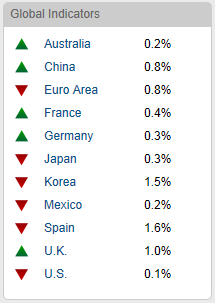 The latest leading indicator readings from the Conference Board came in for Spain and Japan, both in the negative. The table below has turned from almost all green to at least half red. 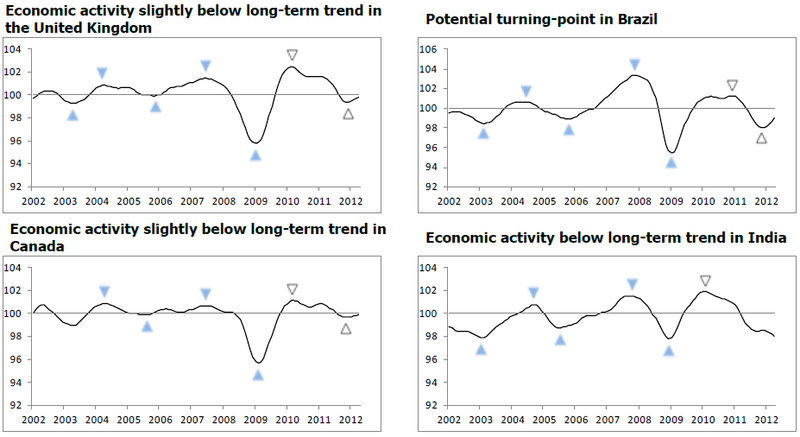 The OECD leading indicators for June are in, and the picture is mixed. USA, Japan and Russia are both positive and upward trending. UK, Germany, Canada and Brazil are negative but trending upwards. China and India are both negative and trending downwards. ECRI leading indicators for the US have dipped into the negative and the trend is down. Note that their indicators have been very volatile since 2008 and two dips to -10 in 2010 and 2011 did not bring on either a recession or a bear market. Drawing all together, the picture is one of mixed to negative, globally. There is the potential that we are seeing a new turn up, looking at the likes of the UK, Brazil and Canada, that may be followed by the weak turning up also, such as India. However, there is also the potential that the weak could drag down the others, and that the current outperformers, such as USA and Japan, are starting to turn down. 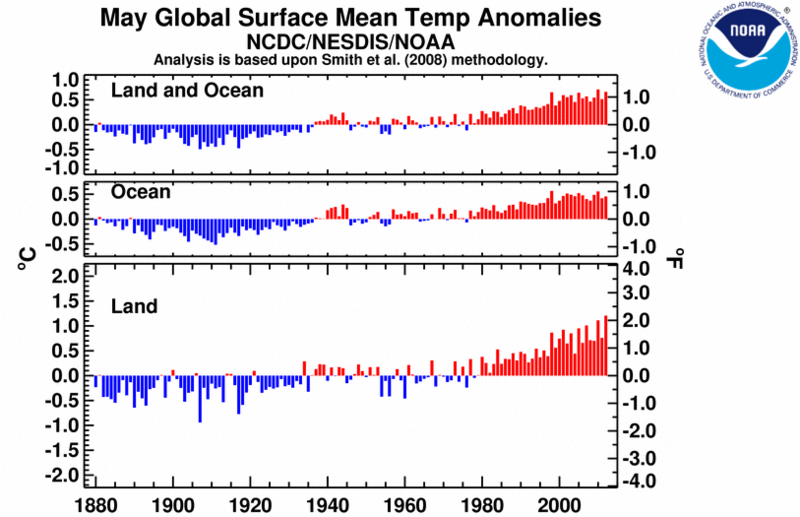 Based on solar cycles we are due a natural upswing. That aside, we have evidence of a new round of global government invervention, in rate cutes and various stimulus/aid measures. The question is how far they go and how quickly, to help leading indicators improve. 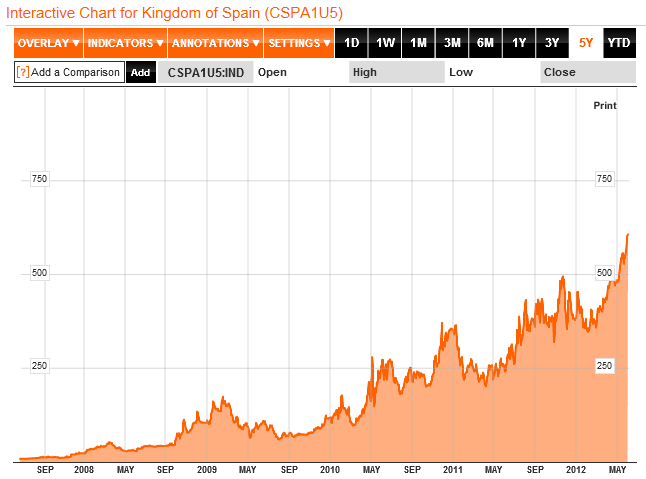 With Spanish and Italian CDSs still pressuring record levels, the ECB is going to need to act again. The FOMC on 20th June is also going to be important. As expected, we saw a reversal at the start of last week. Capitulative Breadth hit the 7-10 capitulation zone on Monday (and has since dropped back to zero due to the rallying). Monday began with more sellling then made an intraday reversal and daily hammer candle – another bottom signal. We printed the missing positive Nymo divergence between the lows of 18th May and 4th June, and positive RSI divergence between the two also. The week then progressed bullishly but Friday’s action in pro-risk, particularly in commodities and the Euro, looked weak for a while but by the close had reversed strongly. The media assigned rumours of a Spain banks bailout coming at the weekend to the reversal. This duly occurred on Saturday and we will see market reaction this coming week (Spanish CDSs had pulled back a little last week, we shall see if this can be sustained this week). Technically we were due an enduring rally in pro-risk, as per the many indicator extremes I posted in my last few entries. Central bank fuel for such a rally was mixed however. China and Australia cut rates. The Bank of England stayed put. The ECB did not cut rates. Bernanke did not telegraph further QE, as some had also speculated, but left the door open to do ‘something’ – or nothing – at the June 20 FOMC, subject to the latest economic developments. And now Spanish banks bailed out by the EU. 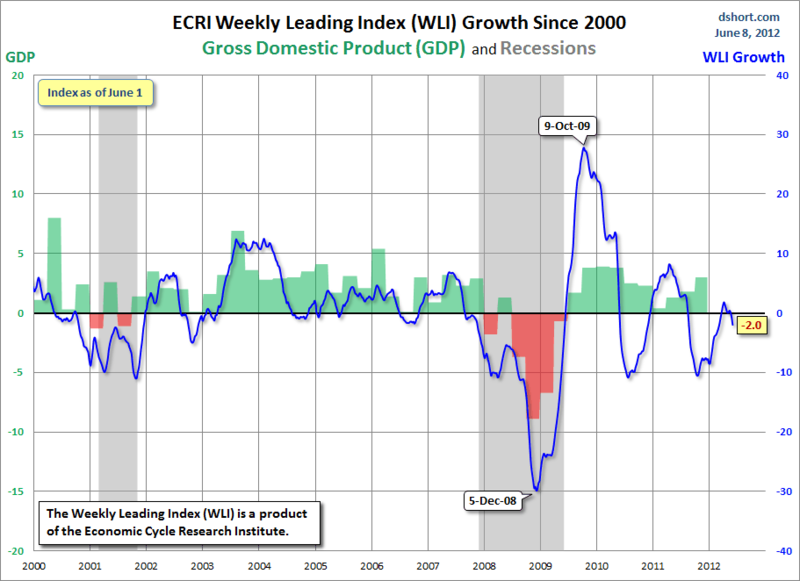 ECRI leading indicators for the US dropped to -2. Chinese data disappointed again this weekend (Chinese stocks made bearish technical action last week, contrary to most pro-risk, and despite the rate cut). Citigroup Economic Surprises languish and haven’t made a turn-up ahead of stocks bottoming, if that was a bottom, as they did in 2011 and 2009. So the economic picture remains weak and the question is whether central banks have begun another round of easing and aiding and stimulating, with last week’s announcements just the beginning, or whether they feel they can largely stay put and see how things develop. Well, suffice it to say that if the picture does not improve they will likely intervene more, but what we need to know is whether we will see more downside for pro-risk ahead if they don’t do more currently. 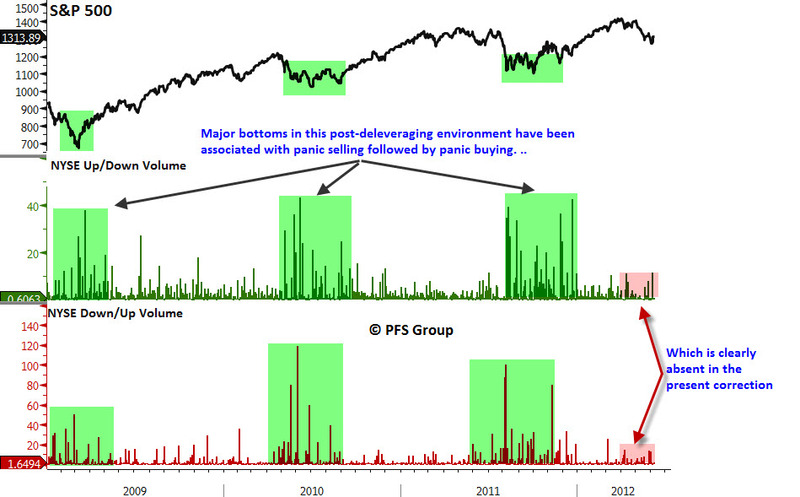 Also, Chris Puplava notes the lack of panic selling compared to 2009, 2010 and 2011 major bottoms. 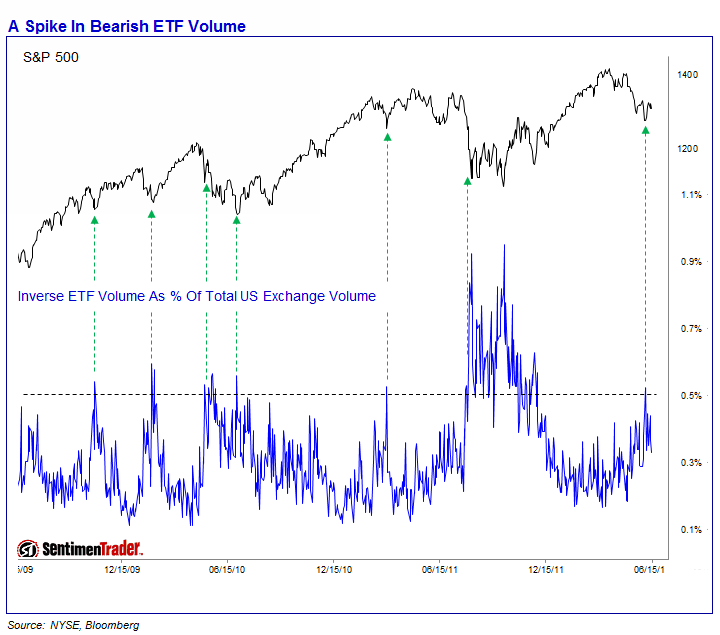 On the other side of the ledger, equity fund flows have hit historic pessimistic extremes, matching real investor action with the sentiment shown in AAII. Also, treasury yields made an inverse parabolic move into the beginning of Monday that resembles other historic blow-off parabolic moves that normally don’t come again for some time. The action as of Monday was a v-bounce that could mark the reversal, and if so, that could spell an enduring move into pro-risk from here. The S&P500 looks pretty bullish. 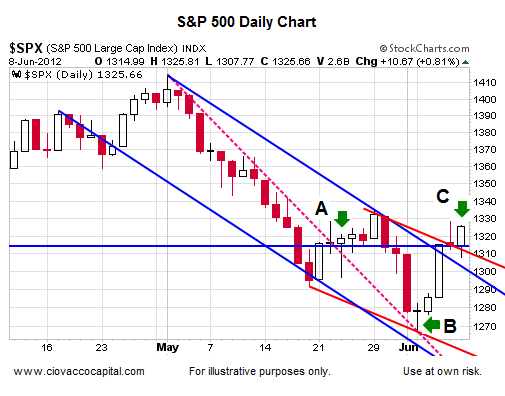 As per Chris Ciovacco’s chart below, we appear to have broken out and backtested important resistance. The question is whether stocks can go on to make a higher high than the end of May at the start of this coming week. If they can’t, then an inverse Head and Shoulders pattern could be in the making as long as stocks don’t exceed last Monday’s lows. Expecting upward pressure into the new moon, I don’t plan to take profits on any of my pro-risk longs yet. The next couple of weeks give us the BofJ meeting, the Greek elections, the FOMC and other Euro meetings. Between them there is the potential to really give this rally some momentum and start to fulfil the historic positive seasonality in an election year from June to November. Or there is the potential to disappoint the markets and leave the focus on weak data and Eurozone issues. Here is what I think. Pro-risk is overdue a counter trend rally here, a sustained upmove that provides some mean reversion for the stretched oversold/overbearish extremes. I expect us to to make that rally now. If pro-risk is heading for another lunge lower, to perhaps give us the missing II sentiment and panic selling extremes then I expect that to occur after we have made a decent retrace upwards for a few weeks. The clues will be in the health of that up move and the developments in economic surprises and leading indicators – i.e. if we rally up but all that deteriorates further then I’d be looking to take profits. However, rising sunspots, seasonally less geomagnetism, presidential seasonality all support mid-year upside. 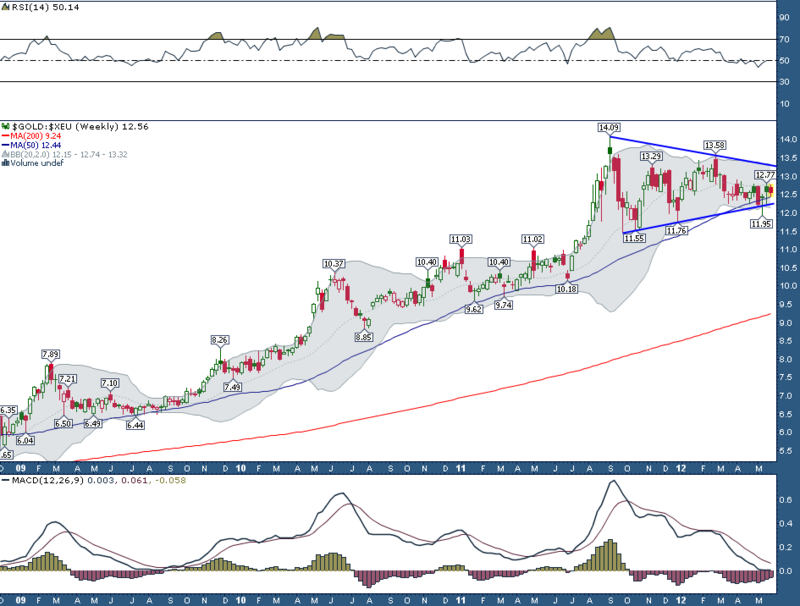 The blow-off move in treasuries suggests an enduring flow into pro-risk from here also. Extremes in US dollar COT and bullish sentiment, and the reverse in key commodities also support an enduring flow the other way. The secular position is closely linked to the solar cycle position, and we should expect a speculative push into pro-risk, with commodities accelerating into a final upmove. I consider us in a different position to 2010 and 2011 as we reach up into the solar peak less than a year away. I think it is more likely we print a strong mid-year this year, rather than a repeat of the last two years. I continue to expect a natural turn up in growth, as per the growthflation of historical rhymes, and a central bank invervention inspired turn up in growth also, at this point. Clearly though, I am frontrunning, and we need to see the evidence build to support that view. 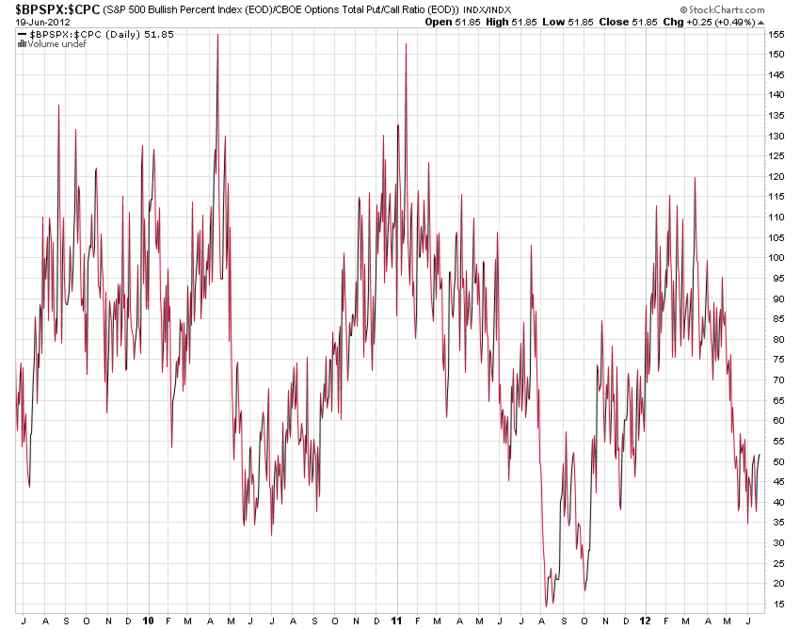 For now, we are tentatively trying to start a pro-risk mean reversion rally, and no more. One last chart. An alternative view of secular cycling using consumer confidence readings, with my notes added. 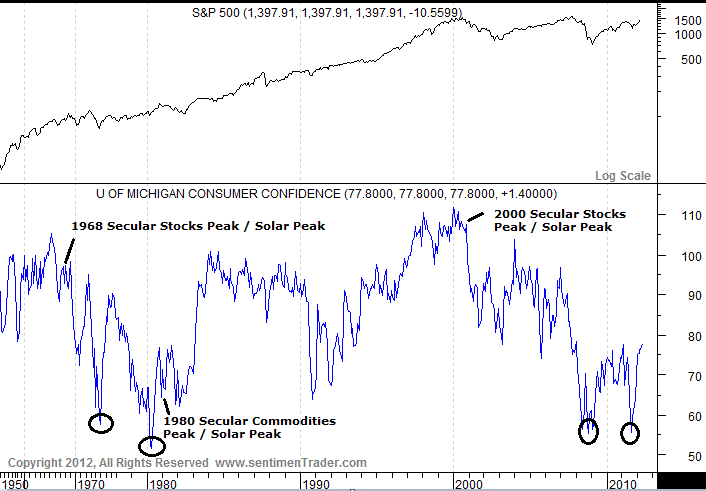 Consumer confidence topped out just before the secular stocks / solar peaks of 1968 and 2000, and bottomed out just before the 1980 secular commodities /solar peak. 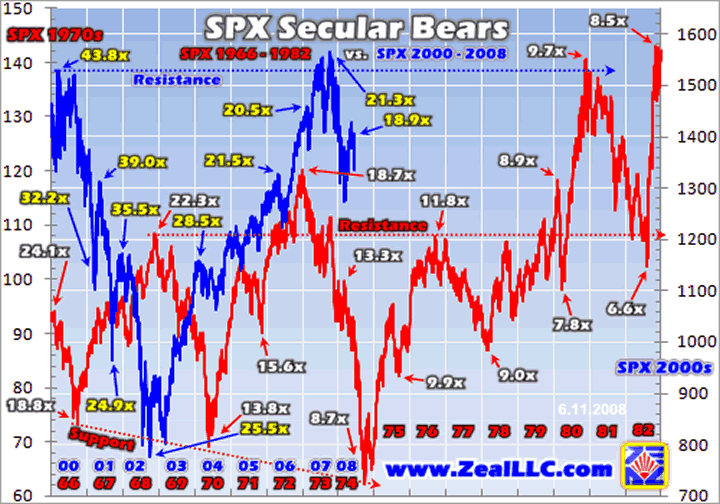 It made twin lows then, like it has in the current secular commodities bull, as shown by the circles. In keeping, consumer confidence should have made its secular bottom, and supporting this the nominal levels reached reflect the last secular lows. A pullback in confidence should be ahead into the secular commodities peak of 2013 and subsequent bear market, but within a new longer term uptrend. As I’m not here next week, here is an additional update following Friday’s falls. Economic data really disappointed again. The only positive is that Surprises are reaching towards a level of historic reversion. As data worsens, analysts move the bar lower, and eventually the data starts to positively surprise. Jobs data was particularly poor, perhaps boosting the chances of Fed action given their dual mandate includes maximisng employment. US ECRI leading indicators came in at -0.6, still fairly neutral but echoing the weakening trend. Euro CDSs continue to climb. Spanish at new record highs. Policy response expected soon. I believe the markets are going to get satisfaction in June through policy response, both in the US and Europe, but also China could help stimulate too. The recent commodity price falls and weak jobs data give the Fed the legroom and reason to stimulate again in some way. Obama’s chances of re-election will only improve if the markets and economy turn up again. Policy response aside, I believe we may also see a natural turn up in growth ahead enabled by lower oil prices and lower commodity input prices on the whole, a cheaper Euro enabling more export led growth in the Eurozone, plus the natural turn up in activity historically occurring as sunspots ramp up into the solar maximum. So I continue to expect a combination of central bank intervention together with a natural turn up to provide the growthflationary finale into next year. Turning to the market action. 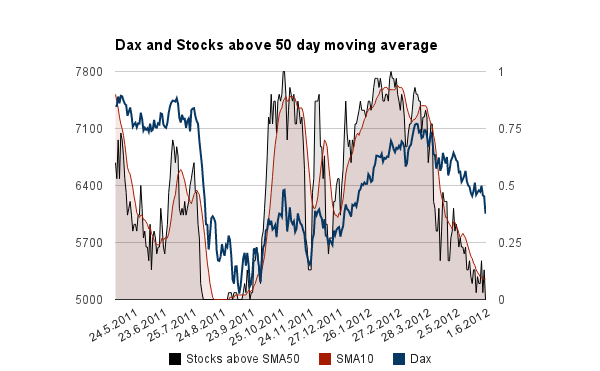 Dax stocks above the 50MA are now at zero. 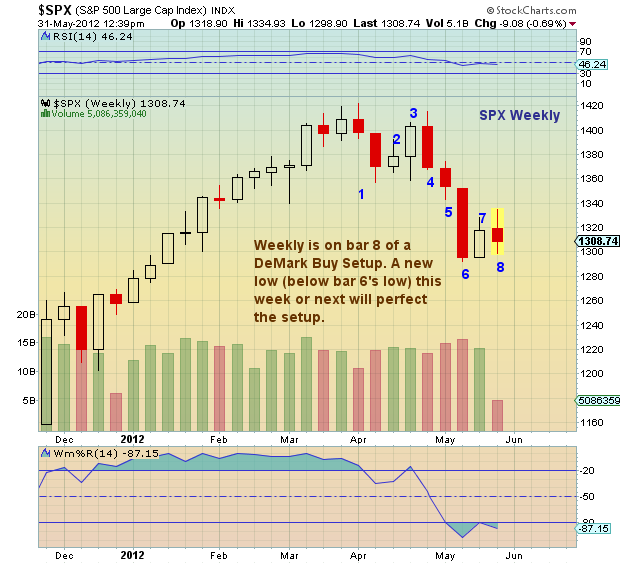 A Demark weekly buy set up is in place following Friday’s falls to new lows. The chart below was taken on Thursday. We now have the positive Nymo divergence that was missing at the last low. 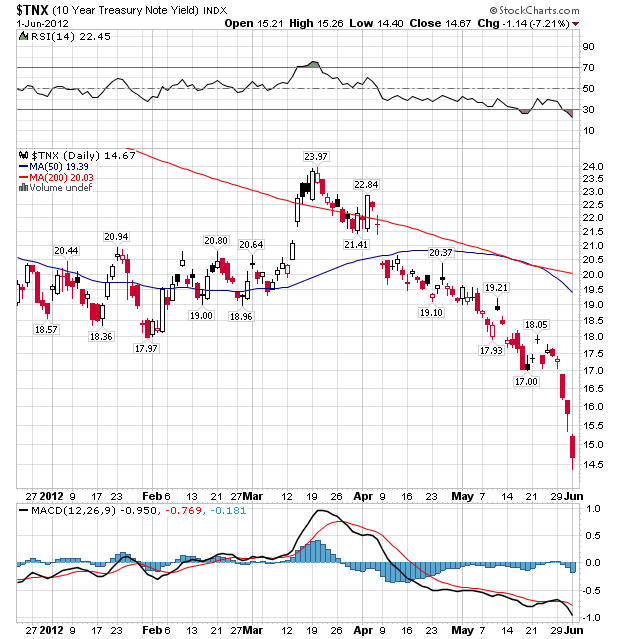 Treasury yields have made a blow off bottom. Dow Jones is down 18 out of 22 days and DSI just hit 10% bulls – US equity market experienced a “90% down day” yesterday – Crude Oil is down 21 out of 22 days and DSI just hit 8% bulls – US Dollar is up 21 out of 25 days and Euro DSI just hit 7% bulls – US Treasury 10 / 30 Yr yields are at 220 year record with DSI hitting 95% bulls. Capitulative Breadth hit 5 on Friday but is expected to reach true capitulation levels on Monday. 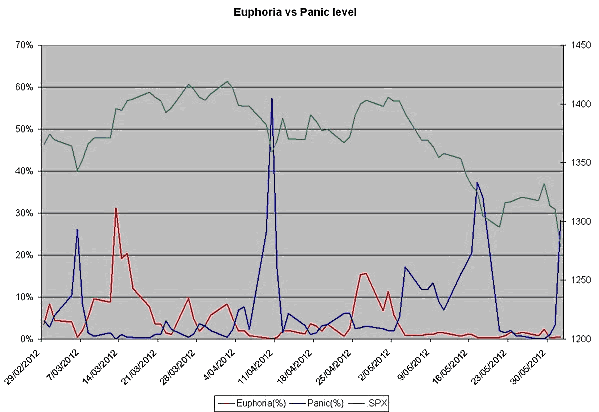 Panic has reached towards the extreme but could also top out higher on Monday. 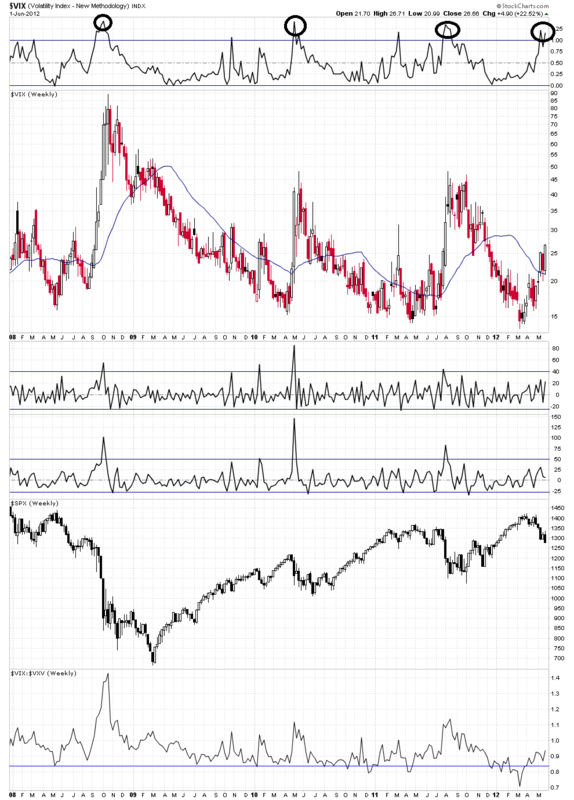 Vix has also reached the kind of overbought level associated with stock bottoms, but could also nominally jump higher on Monday. With Monday being the full moon and peak downward pressure, I believe the evidence is pretty compelling that we may bottom out on Monday. Capitulation is close at hand, and further falls on Monday could bring about an intraday reversal and hammer candle. If not, then Tuesday for the snapback rally to begin. The alternative scenario of a Puetz crash window beginning on Monday and lasting a couple of weeks I believe is now remote due to the extremes and capitulation-at-hand evidence. I am therefore looking to make my last additional pro-risk buys on Monday, unless some surprise good news at the weekend means we break upwards from the outset on Monday. I have updated my short and medium term models. Commodities are well below. The SP500 remains above but the Dax below. As the Dax is cheaper by p/e and the cheaper Euro should help German exports, maybe we will see a period of outperformance in the Dax. Seasonal geomagnetism should be less into July, which means the models should start to turn upwards.